Maintaining and treating wooden decks is hard work and ongoing. 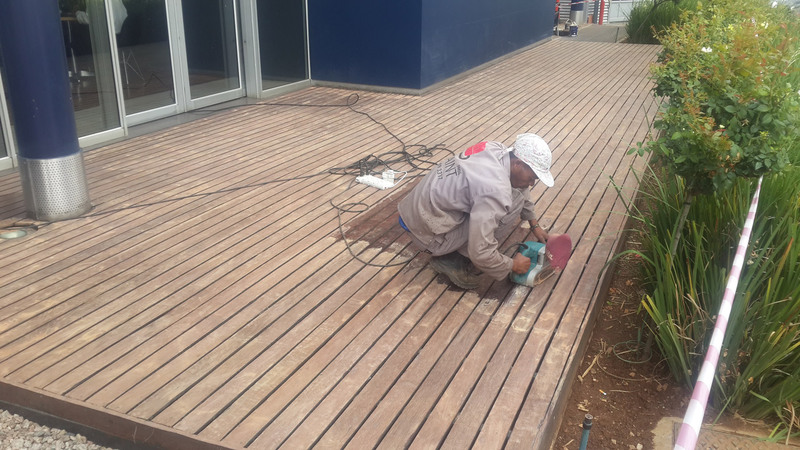 In fact, with South Africa’s extreme weather conditions, outdoor wood decks, especially in Johannesburg and Pretoria, Gauteng need constant attention. It’s not easy if you’re not a professional in the timber decking field and can be very time-consuming. There isn’t a right way or a wrong way to do outdoor maintenance on wood decks, patio or balcony; it all depends on the decking, aesthetics, and architectural design. And, of course, prices of maintenance products and overall cost. 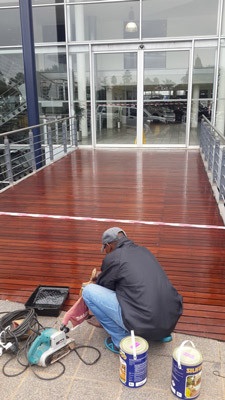 Paint Pros offers its customers in Johannesburg and Pretoria, Gauteng, a specialty service for cleaning and maintaining outdoor wooden decks, using only the best maintenance products and a professional wood deck team that has the training and expertise to keep your wooden deck, balcony or patio spotless and splendid all year round. 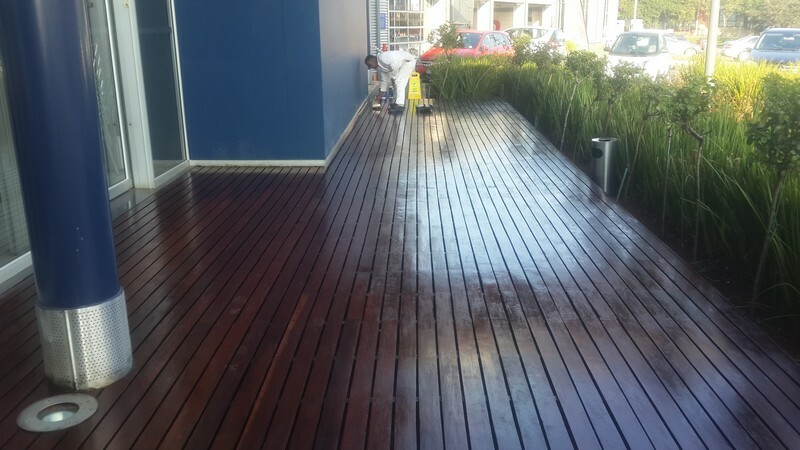 Ask Paint Pros suppliers for advice and tips on cleaning, maintenance, and repairs of outdoor timber decking and the best deck maintenance products to use. Always read the label of a timber decking cleaning product. Outdoor wooden decking cleaners come in bleach and non-bleach formulas. Bleach cleaners are more abrasive and can lighten the wood, while non-bleach products gently remove dirt and grime without damaging the wood fibers or the wood’s natural color. Sweep all leaves and debris off the wood deck and then gently wash it down with tap water. Mix your cleaning product according to how dirty your wooden deck is; use less water if the deck is very grimy and hasn’t been cleaned for a long time. Use a roller, wood deck spray or a bucket and brush to apply the cleaner. The products work better if you keep the deck wet. Let the cleaner sink in and do its work for at least 15 to 20 minutes before giving it a good rinse off. Always wear gloves when applying wooden decking cleaning products and wash your hands thoroughly when you are finished. When dry, apply a clear wood preservative or an exterior stain with a roller or brush. These maintenance products contain a UV protector which protects it from the elements and adds life to your wooden deck. Allow 20 minutes for the product to penetrate the wood before going over the wood with a brush. This is called back brushing and is needed to give timber decking a consistent finish. An exterior stain is either a water-based or oil-based product. It adds colour and deep-penetrating formulas repel water. Choose your wood maintenance products carefully. Always wear gloves and eye goggles when using a wood preservative or an exterior stain. Cover plants and grass around the wooden deck before starting the process. Brush out any pools of preservative or stain so you don’t get shiny or sticky patches. Apply a double coat for good coverage and protection. Stay off the wooden deck for at least two days to give it time to dry and settle. Dispose of the rags and brushes you used as the chemicals in the preservative and stain are toxic for animals and children. Thank you to PaintPros for my amazing wooden deck. Can highly recommend them!